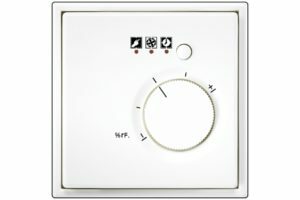 The room temperature control with display is available in two versions: in the Standard version, this controller uses a presence/absence button for controlling the temperature. In the Universal version, automatic and time-based room temperature control is possible to adapt the heating to the individual habits of the residents in the course of the day. The large, white illuminated display shows clear, plain text for intuitive operation as well as an indication of the current temperature. The Universal version also has a time display and a pre-set time switching programme that can be individually adjusted as necessary. 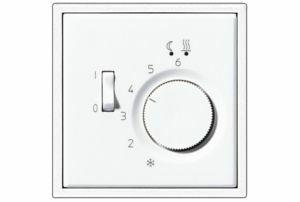 The convenience features are also complemented with automatic summer/winter time adjustment, a weekly and/or daily programme, a holiday function and a short-term timer for changing temperature by the hour. With both versions, Standard and Universal, operation is carried out directly on the operating unit. 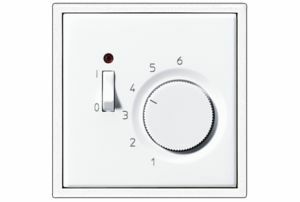 The room temperature control with display is available in the JUNG switch design. The wide variety of materials, colours and shapes of the various designer series ensures that it integrates visually within the surrounding electrical installations.